Pyloric stenosis refers to a narrowing of the passage between the stomach and the small intestine. The condition, which affects infants during the first several weeks of life, can be corrected effectively with surgery.The main symptom is vomiting after feedings. Other symptoms include increased appetite, weight loss, infrequent bowel movements, belching, and diarrhoea. Due to dehydration, the infant may also have fewer wet diapers. Pyloric stenosis can be cured with a surgical procedure called a pyloromyotomy. 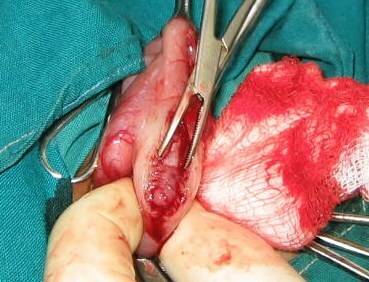 In this operation, the surgeon makes an incision in the baby's abdomen. Then a small cut is made in the thickened muscle of the pylorus and it is spread apart.Analysis in Brazil on pyloric stenosis got the result as the median age was 39.9 years. Seventy out of the 73 (95.8%) patients were male. The median pre-operative body mass index (BMI) was 19.1 kg/m2. All patients had abdominal pain, 34 (46.6%) of them daily and 13 (17.8%) weekly, with moderate or severe intensity in 98.6% (n = 72). The aetiology was secondary to alcohol in 70 patients (95.9%), with a median consumption of 278 g per day. The surgical morbidity rate was 28.7%; there were no deaths. Median post-operative follow-up was 77.0 months; 64 patients (91.4%) had complete pain relief and post-operative BMI was 22.4 kg/m2 (P < 0.001).